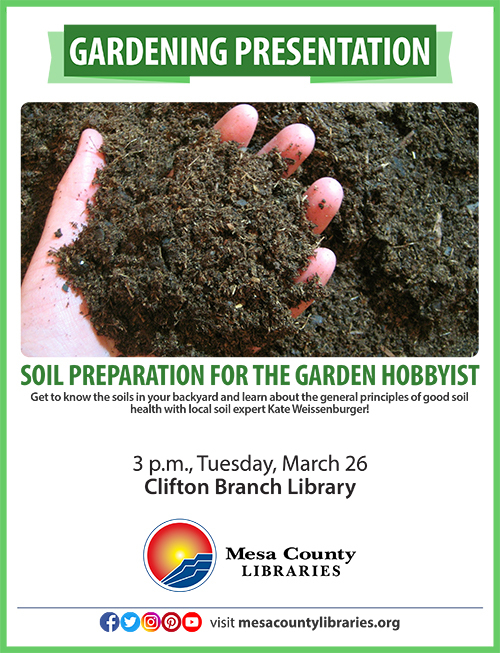 Learn how to test and create the best soil possible in your Grand Valley garden by attending “Soil Preparation for the Garden Hobbyist,” a presentation scheduled for 3 p.m. Tuesday, March 26, 2019, at the Mesa County Libraries Clifton Branch, 590 32 Road. The presentation by professional geologist and CSU Master Gardener Kate Weissenburger is designed to help backyard gardeners get to know their soils in the context of the Grand Valley, including the common soil characteristics and what that means for gardens. Learn about soil tests, how to fertilize or amend soil, and how soil texture affects watering. You will also learn about general principles for good soil health. Weissenburger is a professional geologist with 36 years of industry experience. After relocating to Grand Junction in 2013, she trained as a CSU Master Gardener and is active in consultancy and education through their community programs. Her specialty interest in Grand Valley soils pairs an understanding of local geology with current soil management best practices to better predict and correct many of the soil issues that make growing plants in this area so challenging. This one-hour presentation is open to the public at no charge.